Here we are, new season, new manager, a few new players and all the usual optimism, mixed in with a healthy dose of caution. Saints have never really done the start of the season particularly well. I remember 2010 in Division One where Saints lost the opening match 0-1 to Plymouth Argyle, yet went on to achieve promotion. So, whatever the result, there is no reason to get too worked up. Incidentally the only player in the first team that day still playing for Saints is José Fonte, who was on the bench for this match. The game ended in a 1-1 draw, after a pretty dismal first half, in which Saints seemed to be very tentative. A goal was conceded to what was Watford's only shot on target during the whole match. It is difficult to tell if it was uncertainty with the new system, or just the first match of a new season. They went on to step up several gears in the second half, equalising with a wonderful first goal for Nathan Redmond on his Premier League debut. There was almost a second for him after this, but he was judged to have been marginally offside. The worst thing about the game for me was that there was a new season ticket holder sitting behind me and a couple of seats to the north who insisted on spending the entire flipping game (and a fair proportion of half time) telling everybody, very loudly, exactly what all the players and manager were doing wrong. For the first time we saw the new style kick-off, where you do not have to play forward and Saints didn't, tapping the ball back while the team moved forward. It was the proverbial game of two halves, with Watford fairly physical and with one, or two decent players. 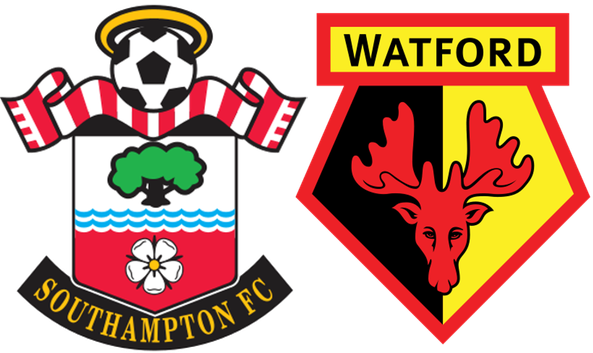 The game wasn't even ten minutes old, when Watford, with some neat approach play caught Saints cold. Mistakes were made in the approach and notably Oriol Romeu missed picking up the run of Capoue, who smacked the ball beyond Fraser Forster. Not the best of starts. There were a couple of scares when Watford got close to the penalty area in the rest of the match, but that essentially was that from them. They then shut up shop and challenged Saints to break them down. That was something they completely failed to do during the rest of the first half. There were a fair few misplaced passes and a general air of frustration (not the least of which was from the idiot behind me). Half time came and Claude Puel apparently told the team to not be afraid and take pride in what they were doing. It seemed to do the trick, but there was still something missing. Part of that seemed to be when the strangely anonymous James Ward-Prowse was replaced by new signing, Pierre-Emile Højbjerg. Suddenly the team had far more of a threatening edge, within three minutes Saints were level, courtesy of a great strike from Nathan Redmond, after the ball had pinged around the Watford penalty area. The incident which really changed the complexion of the game was when a wonderful through ball was chased down by Shane Long and he was away. Watson, who had only come on as substitute for Watford about ten minutes before, was left for dead by Long. Watson despairingly grabbed Long's shirt and wrestled him to the ground. The crowd howled. The referee produced a red card and Watford were down to ten men. Saints really went for it, but in this situation a conventional target man was needed and it was another seven precious minutes before Charlie Austin came on for Long. In the final few minutes the ball was rained in from all angles, but Watford just about held on until full time. So, a draw which should probably have been a victory, but it is early days. There was plenty to get optimistic about in this performance. Firstly the two main signings of Redmond and Højbjerg looked excellent, particularly the Dane. Even Pied, who came on as right back for the last ten minutes, looked decent. Tadić was superb all game. Maybe there was something to the stories of friction between the Serb and the previous manager. Whatever, he was back to his best, tormenting the Watford players, turning them inside out. I am confident in both the defence and midfield of this version of Saints, but I am still not 100% convinced with the forward line. It was crying out for something different. Redmond might turn out to be a striker after all, but there still seems to be something lacking. There is still time and money to fix it before the transfer window shuts. Meanwhile, there is the small matter of Manchester United away next up.